Renovation of the Gaddy-Goodwin Teaching Theatre is underway. A groundbreaking ceremony was held on September 7, 2017 to kick off a remodel of the 150 seat theatre. The Gaddy-Goodwin Teaching Theatre was originally opened in 1989 and is one of three theatres on the Raleigh Little Theatre (RLT) campus. It was designed by the well-known local architect Brian Shawcroft, a native of Nottingham, England who came to Raleigh to teach at the NC State School of Design. Now, after 30 years of use, RLT has contracted with In Situ Studios, a local architecture group, to begin the remodel. In Situ Studios is a small, local company that specializes in modern and sustainable architecture. The contractor for the renovation is Southeastern Properties and Development Company. The groundbreaking ceremony opened with refreshments and remarks from Georgia Donaldson, the Board President. Other speakers included the First Lady of North Carolina, Kristin Cooper, Dickie Thompson from the Raleigh City Council, Nan Strader representing the Gaddy and Goodwin families, and Charles Phaneuf, RLT's executive director. Attendees were encouraged to write their memories from the theatre on the lobby walls before renovation began. In May 2016, the architects met with Raleigh Little Theatre to come up with a complete design plan for the remodel. The plan calls for the entrance a needed “face-lift” and improved technology. The remodel includes a new entryway, larger, accessible restrooms, a new box office, a new concession area, and new fixtures. The renovated gathering area will lead to the garden balcony, which offers a great view of the Raleigh Rose Garden. Raleigh Little Theatre raised $740,000 for this renovation. In total, there were 39 individual donors and 8 institutional donors for the project. The City of Raleigh was the largest donor giving $275,000 for the project. The theatre is located at 301 Pogue Street, Raleigh, NC 27607. For more information about Raleigh Little Theatre as well as information about upcoming shows click here. 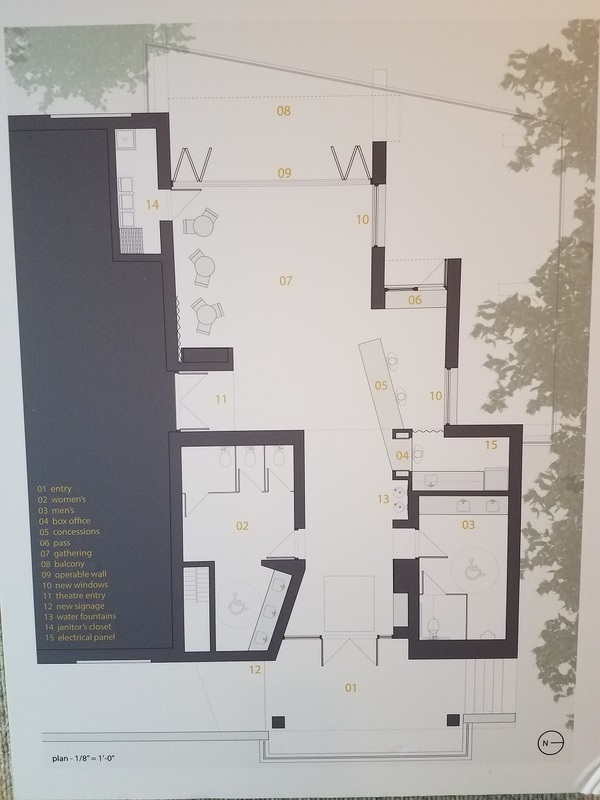 The photo below shows remodel plans for entry way and new gathering area.